Emily Bailey, with Marama Mayrick and Kate Logan is one of the three main creators of the radical film Kotahi te Ao. A Bachelor of Science graduate in ecology and geography, Emily has been working with several environmental and social civil society groups in Wellington, New Zealand providing research, writing and design as well as project and staff management. She also has skills and experience in photography, practical art, field botany, and in running a permaculture garden design business. 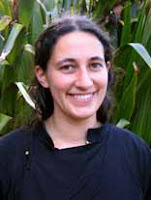 She currently works on contract for the Dept of Conservation and co-manages the Wellington Peace & Environment Centre and the Harakeke Eco-collective (aka WRAG). Bailey's activism has brought her into close contact with Wellington's anarchist set. She has been active in several anarchist linked causes including anti GE and the anti-bypass campaign. On Sunday the 1st of December the urban community garden group 'Growing Community' are organising the creation of yet another garden to stand boldly in the path of the proposed inner-city 'Bypass'. This time in an empty lot on Buller Street near the Terrace Tunnel. Note Sam Buchanan of 128 Abel Smith Street and the Wildcat Anarchist Collective turns up yet again. Marinovich was a co-founder of the “Common Ground Community Garden” which also has links with 128 Abel Smith Street. He later shifted shifted to the South Island’s West Coast to participate in the Save Happy Valley protest, which also has strong links to the anarchist and socialist causes. In 2002 an Emily Bailey an Ana Brown and a Marty Brown, wrote a Pro-Palestine letter to To Victoria University's student paper "Salient" (number 13). It would be interesting to know if this was the same Emily Bailey. It would be also interesting to know if Ana Brown, is in fact Sina Ana Brown-Davis (she usually goes by the name Ana), the Melbourne based support activist of the "Urewera 17". It would also be interesting to know if Emily Bailey is in any way linked to "arrestee" Rongomai Bailey. Emily Bailey's colleague, Marama Mayrick studied art and design at Wellington Art School The Learning Connexion. Rongomai Bailey claims he first met Tame Iti when he "lectured at a Wellington design school where he (Bailey)was a student." Perhaps there is a connection there, or am I stretching things a bit far? No doubt some enterprising MSM media journalist will find out the answers. Thanks, Trev, its been a tough time and this has cheered me up somewhat. You must be a very bored person if the best thing you can think of to do with your life is to invent ludicrous conspiracies where none exist. These people are clearly activists for social justice, not terrorists. The real 'conspiracy' is the timing of these raids - Clark is obviously trying to look staunch to drum up confidence pre-election. Sniff around the motivations and timing for these raids if 'conspiracy' is your thing. Sam-glad to help-methinks it might get tougher yet. Helen-why do social justice activists need napalm? George-you're welcome, but please keep a good eye on that hotheaded boy of yours, so he doesn't end up like Omar. Thank you Helen. Another code phrase - "activists for social justice". In english, readers, this means "agitators against society's criminal and property laws and freedoms". This country is increasingly plagued by groups of people who want to contibute nothing while sucking to the max. Obviously you are a member of one of these parasitical outfits. Good luck with your 'social justice'. Peace be with you. Yeah - I guess teaching at university could be defined as "contributing nothing while sucking to the max" - depending on your perspective. Not everyone 'approves' of higher education. cheers Trevor for your "insightful" yet incorrect supposition as to who Ana Brown is....it was me, not ana-sina brown davis. Yep breaking image suppression yet again. Take that photo down trev. "This country is increasingly plagued by groups of people who want to contibute nothing while sucking to the max. Obviously you are a member of one of these parasitical outfits." Looked in the mirror did ya?